I am getting so close to dividing up blocks and it really is quite exciting. I received 3 more exchange participants blocks in the last 2 days. I expect to mail by Friday latest. I do still need to organize and divide. Here are Sandi's marvelous blocks from A Legacy of Stitches. They really are so cute. I love the brick fabric. Her embellishments are darling. The one with the Santa on top is for me! 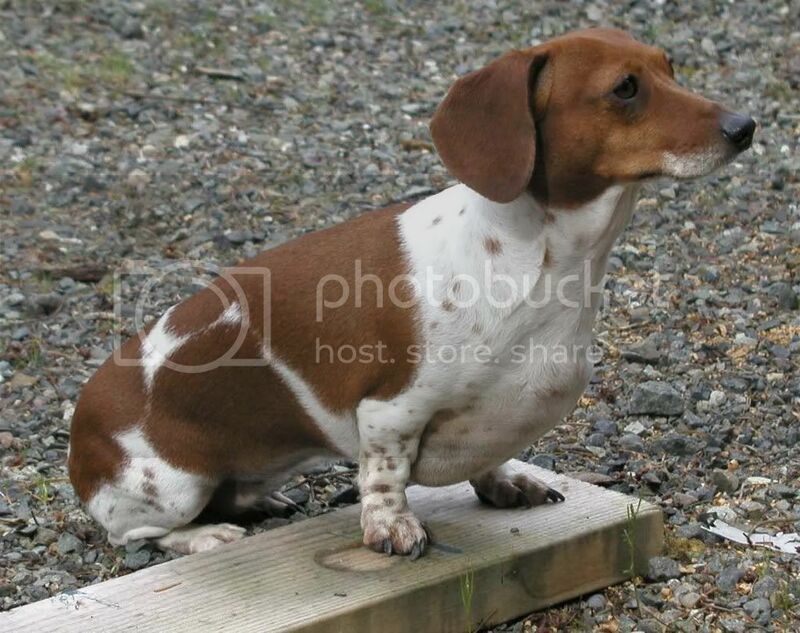 Sandi is a special friend. These are Michele's blocks at Calico Daisy. They are very sweet and made with such care. Michele is very talented and does great work. I've purchased from her Etsy shop and love her work. Look what Michele sent me. She had a little giveaway on her blog a bit ago and she made me some things. I am definitely going to redo our blog header. I have several ideas and they will include one of her great embroideries. She sent me these cute gifts above, too. 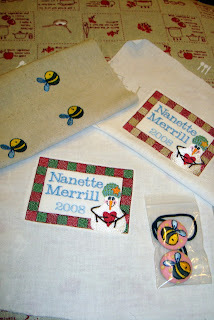 Two are quilt labels and then some bees!! for me to make buttons with. I love the pink ones she made for me too. Thank you Michele! And here are Karen's blocks. Karen lives about 25 minutes from me and I haven't met her but that could change sometime. Her blocks are darling. She did some applique on the doors and they are all really cute. I love the starry fabric in the background. It almost seems to sparkle with soft snow. Look at the sweet gifts Karen enclosed. 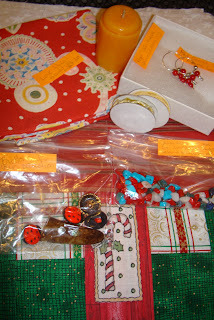 She sent buttons, a candle, beads, ribbon, fabric and earrings! How thoughtful Karen. Thank you. I get a little embarrassed at gifts. But I will enjoy them. The candle smells like a creamsicle. It is heavenly. My sewing room smells so sweet. My Artful Blogging magazine came in the mail. I will save it to enjoy when the blocks are mailed out. I am the first to comment!!! How exciting! I never cease to marvel at the differences in each cottage - they're all wonderful. I love the embroidery - it is too cute! I haven't seen "Artful Blogging" - I think I NEED that magazine, too! 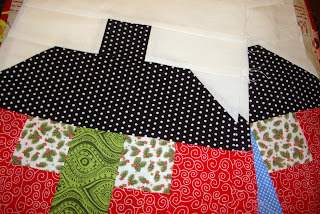 What wonderful quilts you all will have with those wonderful cottages! Lovely things on your blog as usual. Always so visually appealing. I just started reading that magazine. It is a feast for the eyes. The blocks are great, but wow what beautiful embroideries!! How wonderful was that?? Such terrific and different cottages. That santa on the chimney with the brick house is a darn cute and clever. I'm going to be like a little kid checking my mail next week. So much for the wonderful blocks ... Artful Blogging ... I don't think we have that mag in Oz ... will check at the newsagent! Oh I love the santa too. These are so cute. I can't wait to make some cottage blocks. I didn't know there was an artful blogging magazine. You introduce so many new ideas to me! Now I'm going to have to hunt it down. 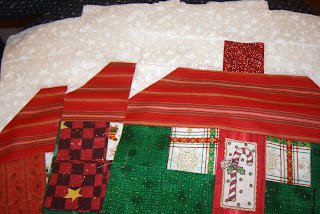 Thanks for showing these blocks...but now I have to go make some more...I may be addicted to Christmas Cottages. Has a support group formed yet? I really do LOVE them. Next week will be like Christmas when I receive my cottages! I'm going on a shop hop at the end of the week...hopefully I'll find some fun fabrics to put with them! This has been so much fun. I can barely wait to get my cottages. Thanks for all your hard work! It is so nice to see the cottages, but even better to see how much people care for and know you. How sweet are the girfts for you., and i must get that magazine! Wow Nanette -- you've been SO busy while I've been gone -- my head is spinning! (Just keeping up with all your fun birthdays would do that LOL!) I've had great fun catching up with you -- it looks like the house swap is coming along beautifully. Super, Super Fun! Each and everyone of the blocks are so beautiful and sewn with love. I can't believe all you accomplish with your busy family. 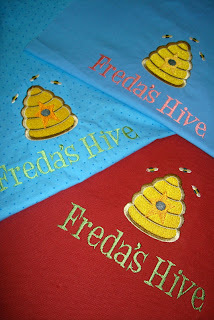 The labels Michelle sent to you look so nice for your quilts and I really liked the 'Freda's Hive gift' you recieved. Your beautiful talents are becoming well known in the quilting world. I was talking to mom when I read your comment this morning. She said, "I am so glad you have found one of Marie's kids. I love her so much." Even if it through marriage...Please pass this on to Marie, for mom. 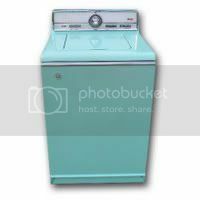 I would love to be at your house and see all those things you are getting in the mail. They are all fantastic. 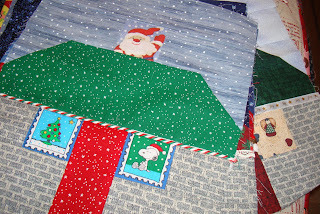 Oh, Nanette, that Santa block with Snoopy in the window is such a treasure...and so many wonderful goodies coming your way - you certainly deserve it! Cheers! the little snoopy peeking out of the cottage is soooo cute! Hey Nanette, this has been just too much fun. They're all the same, but different...Wondering if anyone would be interested in a seasonal cottage exchange??? Nanette, it was me who won the Sarah Smith first prize! I got it in the mail today!! So fun! I'll post a picture of it on my blog in the next few days! Wow, these cottage blocks are so cute! Makes me wish I had gotten in on the fun, although I didn't really have time to this year...maybe you will do this next year, too? 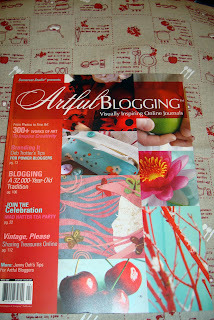 So envious you have the copy of Artful Blogger! My good friend Kathleen is profiled in that issue! 'Tis the Season for Getting?